It is well known that California’s attractive environment supports a high standard of living and ample demand for housing. What should be more well-known, however, is how California’s environmental legislation, while well intentioned, can prevent that demand from being satisfied. It has been Jennifer Hernandez’s and her colleagues at Holland & Knight’s goal to prove just that. We had the opportunity to hear Jennifer Hernandez (the head of Holland & Knight’s West Coast Land Use and Environment Group) speak at the University of San Diego’s annual real estate conference earlier this year. She laid out the most unique and cogent argument in favor of CEQA reform that we’ve ever heard, and we felt compelled to relay the message. The conclusion: Litigation under the California Environmental Quality Act (CEQA) is worsening the state’s housing crisis, increasing air pollution, and perpetuating segregation patterns by class and race. If you are familiar with CEQA please jump to the next heading, if not, please continue… The California Environmental Quality Act (CEQA) (pronounced “See-kwaah”) is California’s broadest environmental law meant to guide the California Department of Fish and Wildlife during the issuance of permits and project approvals. Adopted in 1970 and patterned after the 1969 National Environmental Policy Act, CEQA regulations require environmental impacts be adequately disclosed and mitigated via proposed project alterations and the preparation of additional documentation; an Initial Study (IS), Negative Declaration (ND), or Environmental Impact Report (EIR). Most proposals for physical development in California are subject to the provisions of CEQA, as are many governmental decisions which do not immediately result in physical development, such as adoption of a general plan. The intended result was to protect the state’s fish and wildlife resources by safely controlling urban sprawl, enhance public participation in the environmental review and improve interagency coordination during the planning process. 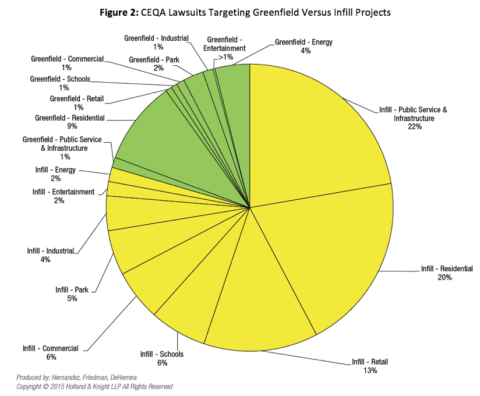 The most notable conclusion was how CEQA legislation has evolved from its’ 1970 inception & mission of protecting natural lands and fighting pollution, into a legal tool used by anonymous (yes, you don’t need to use your name to file an action) special interest groups to curb higher density urban housing, transit, and renewable energy projects. In a follow-up study, “California Environmental Quality Act Lawsuits and California’s Housing Crisis” her group repeated the same methodology to analyze the successive three-year period from 2013-2015, diving deeper into the regional patterns of San Francisco, Los Angeles, and San Diego, with a main focus on the areas surrounding Los Angeles, the state’s most populous and most CEQA litigious region. The findings concurred with the first study and took it a step further, suggesting that CEQA lawsuit abuse is not only worsening California’s housing crisis, increasing air pollution, and increasing the global emissions of greenhouse gas that the state has vowed to reduce, but even more surprisingly, perpetuating and protecting segregation patterns by class and race. 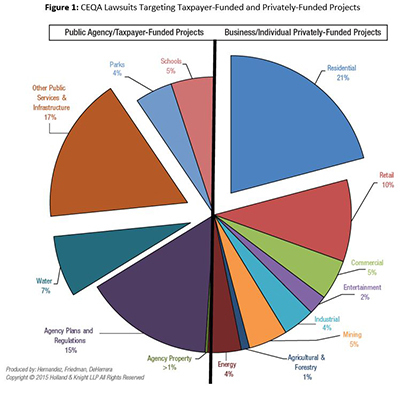 Just under half (42%) of CEQA lawsuits still targeted Public Agency / Taxpayer-Funded projects. 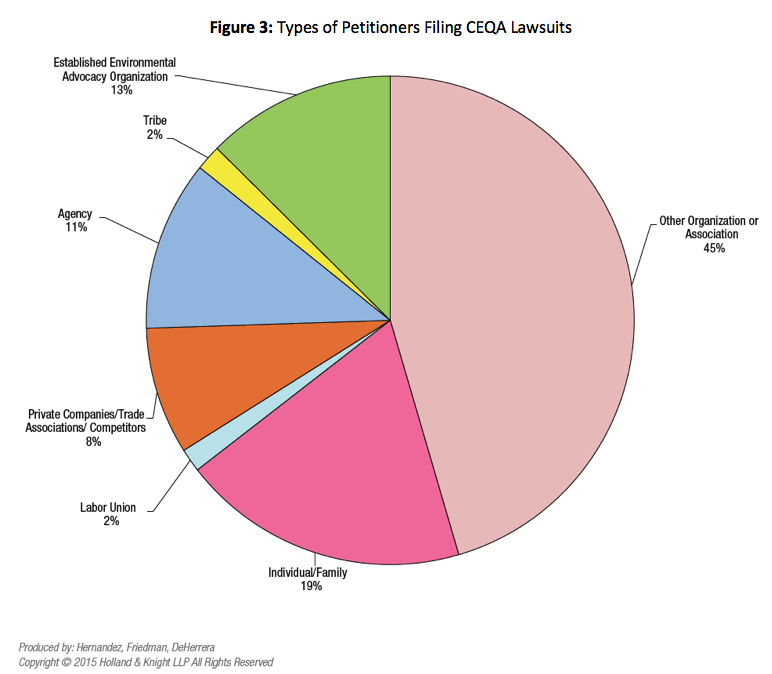 The top three targets of CEQA litigation; residential, public service and infrastructure, and Agency related, increased 6% to 59% of the total lawsuits. The percentage of CEQA lawsuits challenging infill construction projects jumped 7%, from 80% to 87%. 100% of San Francisco Bay Area CEQA Housing Lawsuits and 98% of Los Angeles Region’s CEQA Lawsuits target infill housings in existing communities. 70% of Los Angeles lawsuits target transit-oriented higher density housing. 78% of Los Angeles lawsuits that challenged housing units were in whiter, wealthier, and healthier areas. Structurally, the CEQA litigation process is one-sided and creates an interesting “bet” for the plaintiffs that wield it. Unfortunately for real estate developers and their equity partners, the CEQA process can be uncertain, costly, and often result in numerous rounds of public comment, review, and discretionary approval. This can add a large accumulation of technical and legal fees to a project budget and 18 to 36 months of carrying costs to the project timeline. As the defendant of a potential lawsuit (a CEQA challenge), this is a nightmare, something they’d rather not deal with, and/or pay a great deal of money to resolve. This is also the main reason why joint venture equity and other players in real estate finance are so reluctant to take on a project before it’s gained full entitlement. 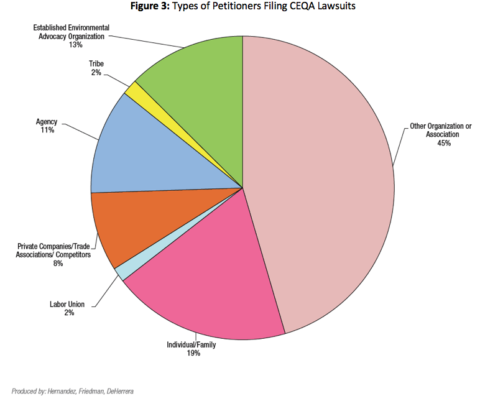 For the plaintiff, CEQA lawsuits can be filed anonymously, which is unlike the federal environmental laws that allow for “citizen suit” enforcement like the Clean Water Act, Clean Air Act, and Endangered Species Act. The burden of proof also sits with the accused, creating an environmentally cautious version of “guilty until proven innocent”. While the plaintiff is not assumed to be correct from the onset, the cost and time to disprove/mitigate potential adverse environmental impacts fall on the developer, stalling, or even stopping a project altogether. Additionally, multiple CEQA challenges can be filed against the same project, repeatedly, and by parties attempting to advance their own economic interest rather than an environmental agenda. Combine that with a relatively cheap and easy filing process, not being liable for paying opposing council’s fees, possibly getting your own legal fees paid for, a 50% chance of winning (historically), and the hopes of getting paid to settle the suit out of court? Which side would you rather be on? One and done – Disallowing duplicative lawsuits on projects that have already completed the CEQA process. Only allow the judicial remedy of removing a project approval (the result of a CEQA challenge that’s been won) to apply to projects that could actually harm the environment or pose a threat to public health and expand legislative relief to more projects. We encourage those who wish to read more about the economic and social effects of current CEQA litigation to digest both reports.